Today we began looking at a new app- Book Creator. I have the paid for version but you can also download a free version in which you can only make one book. If I could only have one app on my iPad it would be this one. It has such potential for writing and sharing. I showed the boys the very basics and let them explore adding images, video, photos, writing freehand, typing and adding audio to add as much as they could on one cover page. There was much hilarity as the boys recorded and inserted video selfies. It was interesting to note that some boys were happily clicking everywhere to see what would happen and others were quite hesitant, concerned about making a mistake. 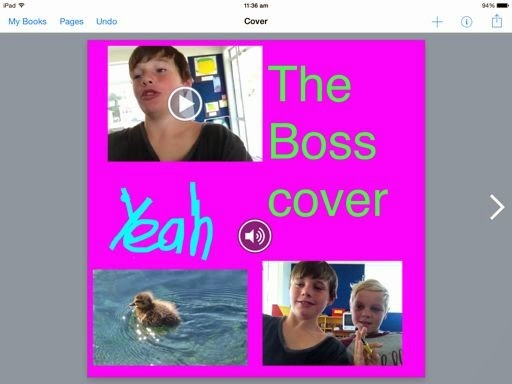 I was also very proud of one of the boys who took it upon himself to show his classmates how to use Tellagami. This is what I wanted to see happen- the boys taking on positive 'schooly' leadership roles. To share the app I used Reflector.app to mirror my iPad onto my laptop whcih was then projected onto the home class display screen. I purposefully didn't 'teach' the app to the boys. I wanted them to go exploring themselves- to see what that the features and the limitations of the app were. I want to build resilience and problem solving in the boys- not leaping in the sort out problems for them. I think the exploration phase was good and certainly produced lots of laughter. We need to have a discussion about what is acceptable in the way of filming other people and deleting images and projects after recording so as not to fill up the iPads with practice photo and video. We used the free app Flick to 'throw' images from my iPad onto other iPads and my laptop. It was evidently 'sick' which is a good thing!!!!!! !